Rebuilding two-stroke or four-stroke engines? Installing wrist pin C-clips in pistons is the engine rebuilder’s worst nightmare. Why? Because it’s difficult, unpredictable and time-consuming. Worse yet, conventional methods of installation can weaken a clip to the point where it fails in service. 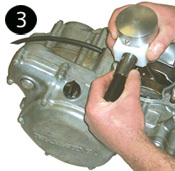 Don’t destroy your sport engine with a faulty C-clip installation! You grasp the replacement clip in the long-nose pliers, ease it into the wrist pin bore, then spend the next few minutes looking for it on the shop floor. Airborne C-clips travel far and wide! Finally, several minutes later, the clip is in place in the groove. And that was the easy one, on the bench. If the first clip was tricky, you can guess how it will go with clip number two. But the aggravation that goes with the job is only one issue. The other one is security. Can you be sure the clip will hold up? Did you overstress it? Is it sitting nicely in the groove, or is the groove so chewed up that it’s half-in, half-out? The worst of it is you really don’t know until the engine swallows the C-clip. Could be 10 minutes, or 10 hours. Could be in the final lap of that big competition with you in the lead. 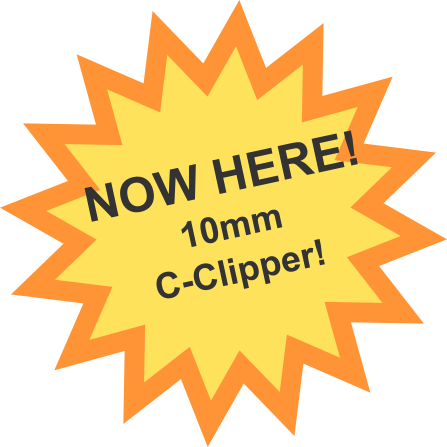 The C-Clipper takes all the drudgery out of the job. No more fiddling with long-nose pliers and little screwdrivers. One push and you’re done, in less than 15 seconds a side, every time. If you repair two or four stroke engines — especially those high maintenance sport versions — you won’t want to do another rebuild without it. 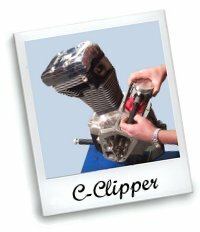 If it’s a performance engine, there’s a C-Clipper to help install its pistons. Now available with adapters for all aftermarket and original-equipment pistons, plain and skirted styles.